When I was around 11-15 years old, I devoured almost all the science fiction books in the local village library. The experience not only inspired me and stretched my imagination, but pre-disposed me to be open-minded about possible large impacts by technology on how life would be lived in the future. Much of the technology that will have the biggest impact on the 21st century remains as yet undiscovered. Some of these discoveries will, presumably, be made by people who are currently still children. My hope is that these children will take interest in the kinds of ideas that permeate Shannon Vyff’s fine book “21st century kids: a trip from the future to you”. Circumstances in which alien civilisations might take an active interest in developments on the Earth. 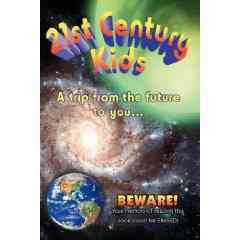 Adults can enjoy reading “21st century kids”, but there are parts of the book that speak more directly to children as the primary intended readership. Since I’ve long left my own adolescent days behind, I’m not able to fully judge the likely reactions of that target audience. My expectation is that many of them will find the contents engaging, thought-provoking, and exciting. It’s family-friendly throughout. One unusual aspect of the book is that several of the main characters have the same names (and early life histories) as three of the author’s own children: Avianna, Avryn, and Avalyse. The author herself features in the book, as the (unnamed) “Mom”. I found this occasionally unsettling, but it adds to the book’s vividness and immediacy. As regards the vision the book paints of the future, it’s certainly possible to take issue with some of the details. However, the bigger picture is that the book is sufficiently interesting that it is highly likely to provoke a lot of valuable debate and discussion. Hopefully it will stretch the imagination of many potential future technologists and engineers, and inspire them to keep an open mind about what innovative technology can accomplish.